ExamOne’s contact center solution has specialized in collecting consumer information for nearly 20 years in an efficient and quality-controlled environment. From complex surveys and questionnaires to friendly reminders, our experienced team and advanced technology can get you answers. 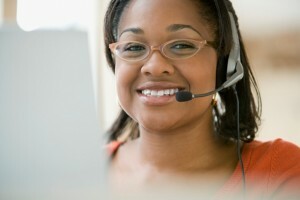 Some industries require a more comprehensive contact center partner to create customized calling scripts. ExamOne collaborates with you to tailor the conversation to fit your business requirements and workflows. Our five North American contact centers offer both inbound and outbound services, as well as warm transfers for real-time communication. For life insurance clients, our contact center can enhance our other data product offerings. We can identify opportunities to reflex Attending Physician Statements, add additional exam/lab requirements, and include prescription history results for condition association during the interview. These opportunities help improve the applicant experience by eliminating the number of touches they receive throughout the process, and increase the comfort level of answering personal questions over the phone rather than face-to-face. Our staffing and technology capabilities also make us the ideal partner to outsource other outreach needs including policy renewal reminders, appointment scheduling, and satisfaction surveys. Our extensive experience with medical and technical terminology gives our staff the ability and expertise to handle complex question sets for surveys or questionnaire data gathering. These skills also benefit other industries that require a higher level of call staff quality and knowledge. If your business utilizes electronic signatures, we are fully integrated with DocuSign® to obtain signatures with voice authorization. With 1.5 million orders completed each year, our contact center specialists are committed to gathering the information you need while providing your audience with a pleasant experience. For more information, email CCSolutions@ExamOne.com.